Very nicely made comforter and so very soft! This is for my teenage son whose room is a mix of colors ... this pulls his room decor together wonderfully. Colors are true to the picture. I was concerned about the colors being too vivid but they resembled the picture. Finished in a unique abstract stitching pattern, this machine washable microfiber set reverses to a solid black and flaunts a medium to lightweight build, making it ideal for year-long comfort. Exceedingly soft to the touch and wrinkle resistant, this set also has a matching zippered bed sham for coordinating charm. My son loves this comforter and it glows under his black lights which is what we were looking for. 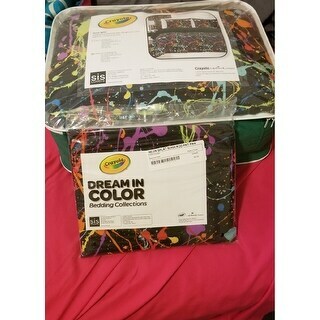 There are lots of colors in it so we got a few different sheet sets Neon green and bright orange! Washes up nicely too. This comforter is extremely soft without snagging easily. The colors are bright and pop. My daughter loves the way it looks on her bed. The curtain and accent pillows also go well with this comforter. Definitely a good purchase! 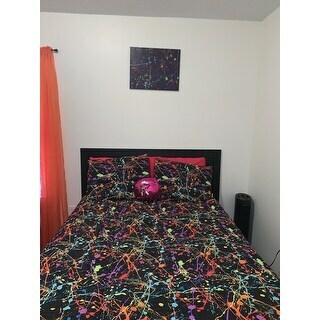 This comforter set is pretty awesome the colors are really nice and the most Important it is warm for our daughter. The price is right and everything came on time when we expected it. I would definitely recommend this product to anyone who is in need. I purchased this comforter for my daughter for Christmas. I received the comforter in a timely manner, however, when I opened it, it was not what I expected. For it being crayola and the amount of money, I expected better. It's thin, chintzy material, not a comforter, not worth the money. I wouldn't recommend. I love this Comforter Set. The colors are bright and the fabric is nice and soft. My daughter loves this set. The shipping was quick and well packaged. Great comforter set! My daughter loved it!!! It's all about color coordination between the desk comforter rug and curtains what 12 year old aspiring artist wouldn't love this! Love the comforter set! Bright colors! It was for my 9 year old daughter and she loves it! Not very thick, but keeps her warm even during the winter! The colors are more vibrant then the picture displays. Colors are vivid and really cool! Made well, sure glad we purchased! Bought 2!- this décor has brightened up everything. Highly recommend. The Queen size fts my new bed perfectly. "How do i order curtains?"